THIS could be the world’s first picture of a real alien according to fresh claims that police in Argentina took the bizarre snap during a call out. 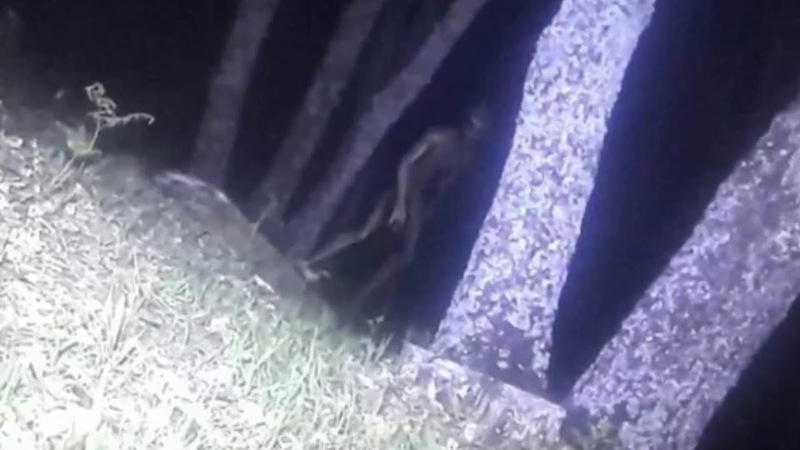 The shocking image is sweeping alien and conspiracy theory websites after emerging on Facebook and being reported by Diarioprimeralinea.com.ar in the South American country.Online reports have suggested that police were called to reports of strange behaviour in the Parque Mitre area of Corrientes, before they spotted a humanoid-like being and photographed it on a mobile phone.Debunkers have already branded it a CGI hoax, saying it is an edited version of an alien shown in the ET film Signs, starring Mel Gibson, or a still from Spanish alien horror flick Ovni. Terry Larch wrote on mystery website Freaklore.com: “In the country of Argentina, one of the greatest alien photos ever taken has been recently captured. “The photograph is incredible and may be the best evidence of aliens living among us yet. ALIEN HOAX: The image has been debunked as a still from a Spanish ET horror flick. ” On September 13, 2017 in the area known as Parque Miter, an upright humanoid extraterrestrial was spotted and a cell phone picture was taken of it.”Initially, a local group of teenagers reported seeing a strange looking creature wandering nearby. “Later, a group of police officers from Commissariat arrived on the scene. “They scoured the area, to find this unusual sight of panicked teens and an alien being. According to reports, the “creature” fled into the Paraná River, when officers approached and they lost sight of it. Mr Larch said: “The image is so good in fact, it does raise suspicions about its authenticity. “Clearly, while glancing at the photograph, the shape and size of the alien is rather remarkable to see. “It has the oval head shape and almond dark shaped eyes. Its hands appear to have only three fingers protruding outward. “From the distance of where the photograph was taken, it appears to be fairly tall in height as well.”The claims appear to have first been published on the Facebook page of Argentinian local radio station LT7AM 900, based in Corrientes, before being picked up by Diarioprimeralinea.com.ar. ALIEN HOAX: UFO researcher Malcolm Robinson revealed the image in the UK at Paraforce today. Paranormal researcher Malcolm Robinson revealed the image to the UK at the Paraforce paranormal convention in Witham, Essex, on Sunday. It was during a lecture he gave on pictures that could potentially be real aliens visiting Earth, and he said it was the latest one to emerge. He said he did not know if it was real or a hoax, but argued aliens are visting Earth, and it was worth looking into further. Mr Robinson said: “I do believe we are being visited by these creatures. The evidence for me is absolutely overwhelming. One debunker with the user name Newdawnrising commented of the image: “Fake. Image taken and reversed from the movie “Signs”. “The face is the only change. “The exact body positioning only flipped to face exact opposite. Scott Brando, who debunks hoax videos through his website ufoofinterest.org, said the image was in fact just a still from a Spanish alien horror movie.